This post is for the people who have emailed and asked about my Fitness Coach Mentoring service. Those of you who are interested in beginning this service in May 2013 have to complete the below intake assignment (to the best of your ability) before you will be eligible to partake. For those interested but are not able to commit at this time, there will be another offering for registration in September 2013. Email to be added to this waitlist. - the basics of ATP physiology and why it is important to training philosophy and understanding. - how to assess an individual based on their known physical abilities using strength ratios and prediction formulas. - how to assess an individual to discover currently unknown abilities and limitations (i.e. energy system testing, muscular endurance testing, and the like). - how to design effective weight training programs to gain muscular strength, power, and mass. - how to effectively manipulate tempos, repetitions and sets in weight training programs to optimize results. - how to overload and de-load a weight training protcol in a safe and effective manner to ensure proper adaptation and subsequent performance improvement. - how to design effective oxygen independent (i.e. anaerobic alactic and anaerobic alactic) energy system training sessions. You will learn general ideas about when and how to implement these kinds of training sessions, what kind of person this will best suit, and why training this system is imperative to performance in high intensity events lasting from 1 minute to 30 minutes (or more). - how to design effective oxygen dependent (i.e. aerobic) energy system training sessions. You will learn how to design training sessions for both single modality (i.e. cyclical modalities like running, biking, etc.) and multiple modality (i.e. external loaded movements, bodyweight movements, and cyclical movements). You will learn how designing these sessions is very individualized, both from a goal perspective and an ability perspective. - why the oxygen dependent energy system is the back bone of performance and longevity in most sporting and fitness events. - how to propely assess and design a variety of energy system training templates (i.e. weekly, monthly, and yearly planning) to best prepare and advance the abilities of a single competitor/client. You will be taught how to design training templates to meet the needs of ANYONE. - how to properly assess and design a variety of energy system training templates (i.e. weekly, monthly, and yearly planning/periodization) to best prepare and advance the abilities of all individuals partaking in a group based training facility/program. - how to assess and differentiate individuals and groups in based on testing parameters and certain distinct traits in order to optimize their training program/longevity. - how to adjust a training plan with an injured client/competitor to still allow for maintenance and/or progress. - meetings typically occur on a monthly basis, either once per month or twice per month based on your need/requirement. - if meetings occur on a monthly basis, they will last up to 90 minutes. If the meetings occur twice per month, they will last up to 45 minutes. - these meetings will occur via an online face to face exchange (i.e. Skype, FaceTime, etc.) or in-person for those near our Calgary based facility. - during each meeting we will discuss your recently completed homework/assignment(s) and address the next part of your learning. - If your focus is to design training programs for a certain group of individuals (i.e. specific sport, age, ability, etc.) then the focus of the service will be entirely based on that. - Many individuals utilize this service as a means to improve the program design for their own individual client's/competitors. - Many individuals utilize this service as a means to improve the program design for their own fitness facilities, typically for the group classes that occur there. - Many individuals utilize the service as a means to upgrade their own knowledge and understanding in order to put it to use for themselves because they are not coaches or fitness facility owners. - Coaching experience and training knowledge varies greatly amongst all. Generally, no matter what level you are at in your coaching journey, we will create a path to lead you to success. - There is no commitment length. As with all of my services, if you are unhappy with the service or feel you need a change, you are not held to anything. - However, anything less than 3 appointments is generally not useful for significant improvement and understanding. - $150 per 90 minutes of appointment (i.e. 1 x 90 minute meeting per month OR 2 x 45 minute meetings per month). *The simple reason for this homework is to assess your ability to design a variety of training programs based on different scenarios. This is how things will work in real life coaching. You will have many different scenarios/client's to deal with if and to help succeed. The needs of everyone will not fit into your favourite program. It's impossible. *Do your best. Do not be intimidated. There is no failure. You will only learn from this experience. *MUST be submitted via e-mail prior to our first meeting. 1) What is fitness? Give a few main points. No examples needed. Do NOT copy and paste from somewhere else, use your OWN words. 2) In 150 words or less, define YOUR training philosophy. Basically, where does your bias and decision making come from when it comes to both analyzing and designing training? 3) Design a 3 day fitness competition to establish who is fittest based on what YOUR definition of fitness is. Assume there are no limitations on equipment, space, judging, etc. Describe in detail what the point of each event was (i.e. What were you trying to test, why you selected the movements, how will this test distunguish people, etc. How valid, reliable, and repeatable is the test? What is a legitimate test? Was is just for "show"?). 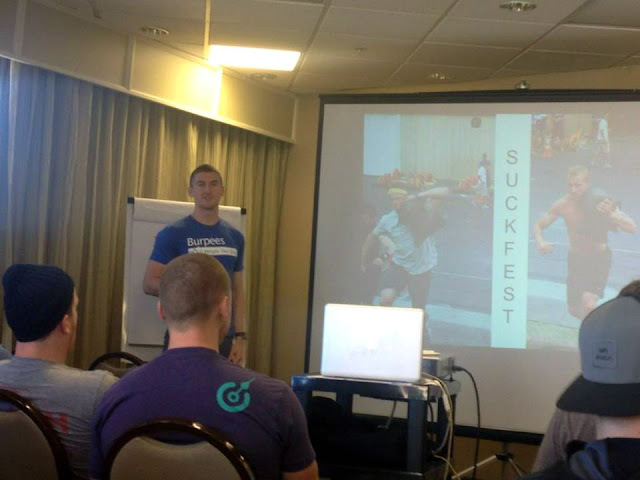 4) Design a 6 week training program for a 10k runner. This person's goal is to do a 10k time trial at the end of the 6 weeks (i.e. peak). This person is able to run a 5k in 19 minutes, a 10k in 40 minutes, and a half marathon in 85 minutes. Assume no injuries or movement limitations. Is able to train once per day, 5 times per week, Monday and Friday are off days. Please provide all of the training sessions for all of the 6 weeks. As well, be sure to prescribe intensity with each of the running training sessions. To the best of your ability, adjust the weekly running volume and intensity to allow for optimal training results while avoiding over-use or under recovery. 5) Assess and design the training for the following 2 individuals. I want to see one week of workouts (i.e. all their training sessions) for each person. Ensure the week has a structure and a plan such that the following week would follow a similiar scheme. Prior to the actual design of the workouts, I want to see your initial assessment of the individual. Assume both individuals just have the goal to become "fitter" in your definition of the word. Assume both individuals have no pre-existing injuries, and do not have any mobility limitations. Assume they are able to train on Monday, Tuesday, Wednesday, Friday and Saturday. They are only doing one training session per day. - is unable to perform a muscle-up, handstand push-up, or chest to bar kipping chin-up. If you are unclear of what is expected of you for this initial assignment, please e-mail for clarification. Here is some of the feedback from this service from some of my Fitness Coach Mentoring clients. If you have a question about the service that was not stated above, please e-mail.